STOLEN NCT CERTIFICATES from an armed holdup in 2013 are still in circulation. Some 850 official certificates were taken during an armed holdup of an NCT centre in Drogheda in October of 2013. Gardaí told TheJournal.ie that the incident is still part on an ongoing investigation and that no one has yet been brought before the courts in relation to the holdup. 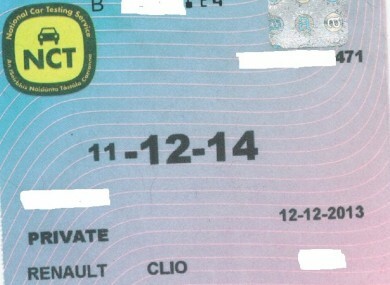 The NCT website lists the NCT certificate serial numbers that were stolen and asks people who are buying a second hand vehicle to check the number on the NCT disc. Aherne added, “It is possible that unscrupulous individuals are offering these stolen certificates for sale and buyers may not be aware that purchase and display of these certificates constitutes an offence. Conviction for this offence carries five penalty points and Courts may impose a fine of up to €2,000 and/or up to three months’ imprisonment. Email “Stolen NCT certs from armed holdup in 2013 still in circulation”. Feedback on “Stolen NCT certs from armed holdup in 2013 still in circulation”.